Thrall is a curious sort. I don’t believe that he really wants to do Israel in, but he argues powerfully (in a NY Times op-ed and in a longer piece in the Guardian) against the liberal-Zionist view that a reasonable peace deal can be negotiated if there’s an amenable political alignment and a sufficient good-faith effort by all negotiating and mediating parties. He sees Israel as making this impossible. Postmortem accounts vary in their apportioning of blame. But nearly all of them share a deep-seated belief that both societies desire a two-state agreement, and therefore need only the right conditions – together with a bit of nudging, trust-building and perhaps a few more positive inducements – to take the final step. In this view, the Oslo accords of the mid-1990s would have led to peace had it not been for the tragic assassination of the Israeli prime minister Yitzhak Rabin in 1995. The 1998 Wye River Memorandum and its commitment to further Israeli withdrawals from the West Bank would have been implemented if only the Israeli Labor party had joined Benjamin Netanyahu’s coalition to back the agreement. 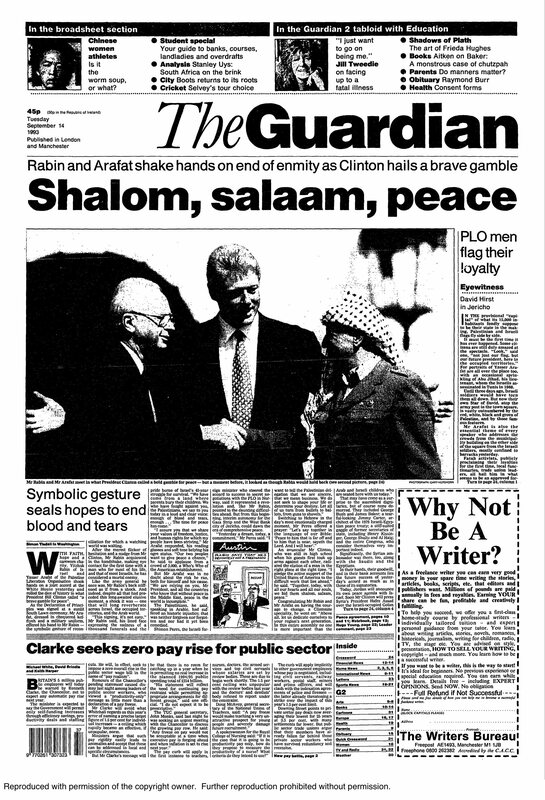 The Camp David summit in July 2000 would have succeeded if the US had been less sensitive to Israeli domestic concerns, insisted on a written Israeli proposal, consulted the Arab states at an earlier phase, and taken the more firm and balanced position adopted half a year later, in December 2000, when President Clinton outlined parameters for an agreement. Both parties could have accepted the Clinton parameters with only minimal reservations had the proposal not been presented so fleetingly, as a one-time offer that would disappear when Clinton stepped down less than a month later. The negotiations in Taba, Egypt, in January 2001 were on the brink of agreement but failed because time ran out, with Clinton just out of office, and Ehud Barak facing almost certain electoral defeat to Ariel Sharon. The two major peace plans of 2003 – the US-sponsored road map to peace in the Middle East and the unofficial Geneva accord – could have been embraced had it not been for a bloody intifada and a hawkish Likud prime minister in power. In his Times piece, (“The Past 50 Years of Israeli Occupation. 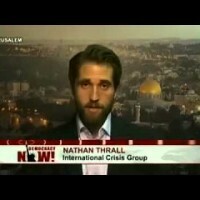 And the Next.“), Thrall argues that concessions have come from Israel only as a result of pressures, whether of a political nature from the US or from Palestinian violence. This is partially true, but he goes too far — the bloody efforts of Hamas and Islamic Jihad strengthened the Israeli right in opposition to Oslo, leading to the murder of Rabin in ’95, and Netanyahu’s election in ’96. This resistance also encouraged Ehud Barak to put negotiations with the Palestinians on the back-burner until he felt he had no choice (attempting to settle with Syria first and to buy-off the pro-settler National Religious Party with some expansion of settlements). Then Barak undiplomatically attempted to strong arm Arafat into a deal at Camp David, presented in a desultory fashion, with no proper preparation by subordinates. Arafat then destroyed the dovish left’s electoral majority by “riding the tiger” of the Second Intifada (in the words of Robert Malley), rather than attempting to stop the violence, as urged by a delegation of Meretz and Labor MKs visiting him in Ramallah in the early weeks of that uprising in the fall of 2000. Thrall’s challenging analysis fails because he doesn’t take into account the accidents of history, including the personality quirks of individuals thrust into leadership. Were any of the following inevitable: Baruch Goldstein’s blood-soaked incursion among Palestinians at prayer in Hebron, spurring the efforts of Hamas and Islamic Jihad in revenge? Rabin’s assassination, making the electorally inept Shimon Peres his successor? Olmert’s negotiations with Abbas cut short by a corruption charge from years before he became prime minister? Etcetera, etc. The heck with the messy details, says Nathan Thrall.